Understand Al-Qur'an Academy > Articles > 5 Habits to Overcome Loneliness! As Muslims, we can show others how to overcome loneliness by adhering to Islamic teachings and lifestyle. One of the Names of Allah  is, Ash Shafi’I (the Curer). If loneliness is a disease, then only He  can cure it. Narrated Abu Hurairah  that the Prophet  said: “There is no disease that Allah has sent down except that He also has sent down its treatment.” [Sahih Al-Bukhari: 5678]. In the light of this Hadith, one should first seek Allah’s help. Some effective ways to connect with Allah are: pouring one’s heart in supplication to Allah while in prostration, praying during the last third of the night, reciting and pondering upon the Qur’anic verses, repenting to Allah from the seen and unseen sins. Keeping close contact with relatives is an obligation in Islam. The Prophet  said: “whoever believes in Allah and the Last Day, should unite the bond of kinship.” [Sahih Al-Bukhari: 6138] We can occasionally buy gifts for the family members, call them over the phone or pay a visit to strengthen the bond with them. Also, helping them or just being by their side during difficult times would increase our self-worthiness and attain the pleasure of Allah. Attending the weekly Friday prayer or performing the five obligatory prayers in a Masjid, would help us to be in constant touch with each other. Abu Huraira  reported: The Messenger of Allah  said, “When it is a Friday, the angels stand at the gate of the Masjid and keep on writing the names of the persons coming to the Masjid in succession according to their arrivals. The example of the one who enters the Masjid in the earliest hour is that of one offering a camel (in sacrifice). The one coming next is like one offering a cow and then a ram and then a chicken and then an egg respectively. When the Imam comes out (for Jumua prayer) they (i.e. angels) fold their papers and listen to the Khutbah.” [Sahih Al-Bukhari: 929] Such gatherings would help one to overcome loneliness and shun away bad companies. Physical activities are highly encouraged in Islam. Learning new skills in a group especially which involves physical activities like swimming, gardening, playing soccer, can boost one’s confidence and feel more energetic. This might also help to get rid of any kind of emotional exhaustion. Seeking beneficial knowledge and teaching them to others are some commendable acts in Islam. Enrolling into Islamic courses, whether online or onsite would help one to attain Allah’s pleasure and at the same time keep their mind engaged. Later, one can teach it to others and be an active member in the society. We should try our best to take effective measures to prevent loneliness, especially, when it leads to adopting the immoral lifestyle. By studying and adhering to the teachings of the Qur’an and Sunnah one can be an amazing example for the community to curb such social problems. One of the wonderful ways to begin the Qur’an study could be enrolling into one of the UQA (Understand Qur’an Academy) courses and study the resources. Shagufta Siddiqui January 20, 2019	Log in to reply. 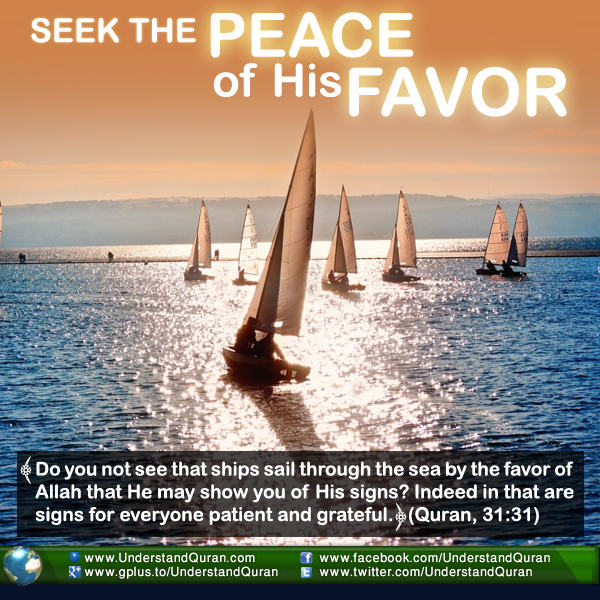 jazakAllahu khairan kaseeran for the informative article.But I could not understand the caption which says”Seek the peace of His favor’. Could you please explain. Haret Abdullahi Hambe January 21, 2019	Log in to reply. Jazakallahu Kheiran the UQA team. I enjoyed reading your article on ‘5 habits of overcoming lonliness’. Insha a Allah I will try to put them into action. Brothers, I am kindly requesting if you can guide me on how I can learn Arabic so that I understand The Quran. Masha a Allah, I am good with the recitation of the whole Book but I have challenge understanding the meaning to a satisfactory level to generate adequate ‘Qushuc’. Kindly assist. UQA_S January 21, 2019	Log in to reply. Alhamdulillah! we teach Tajweed, understand Qur’an and memorization of Qur’an courses. Our highly dedicated & professional tutors will teach you from scratch at your convenient schedule and in your preferred language insha Allah. Safiya March 5, 2019	Log in to reply. Zeba hussain March 8, 2019	Log in to reply.